Have you been invited to a baby shower and have no idea what to take? Well, diapers are something that a new mom can never have enough of. But, if you love getting a little creative, then there’s a simple way to gift lots of diapers, regardless of the theme of the baby shower. If you don’t know whether the mom-to-be is expecting a boy or girl, a stroller diaper cake could be the perfect gift. 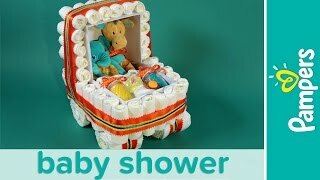 Here’s how to make a stroller diaper cake in just a few easy steps. Assortment of baby accessories such as blankets, stuffed animals, bottles, pacifiers, etc. Remove the lids of two shoeboxes. You won’t need the lids for this project. Take one shoebox and cut 0.25" off the end. Hot glue the insides of the shoeboxes together, so they stay in place. Loosely wrap some elastic around the edge of the bottom box; then glue the elastic ends together, and set it aside to dry. Roll the open end of each diaper inward until each roll is nice and tight. Wrap a rubber band around the diaper roll to hold it in place. Slide each rolled diaper under the elastic on the box. Keep at it until the entire circumference of the bottom box is surrounded by diapers. To form the canopy of the stroller, wrap another band of elastic around the vertical box. Slip this elastic band underneath the other band. Hot glue the ends, and set it aside to dry. As you did before, roll and secure more diapers across the top and sides of the vertical box, stopping at the intersection with the lower box. The elastic from the top box will be protruding on both sides. Hide it by tucking the elastic in between the vertical diapers on the lower box. Wrap ribbon (or fabric) around the bottom of the stroller to cover the elastic band. Secure the ends to each other with hot glue. Don’t get any glue on those diapers, though! Repeat this step on the canopy, covering the visible elastic. You can layer different sized and patterned ribbons on top of one another, if you want to add your own, creative touch. To make the wheels for the stroller, roll five Pampers Diapers together, and secure them with a large rubber band. Hide the elastic by wrapping ribbon around each bundle, and secure the ends of the ribbon with hot glue. Dot hot glue on the ribbon of the wheels, and stick them onto the bottom of the stroller. Make sure to glue them so the rolled edges face the sides. Fill the interior of the stroller with an assortment of baby accessories like blankets, stuffed animals, bottles, and pacifiers. Now that you’ve finished making your stroller diaper cake, you’re all set to go to that baby shower. And, if you’re hosting the upcoming baby shower and plan to use the stroller diaper cake as a decoration, then you might also like to read up on stroller-themed baby showers for even more inspiration. Plus, take a look at these baby shower game ideas, so that your shower is a memorable day for everyone.